This Event has been read: 614 times. I thank god for my children every day. Without them I’d never know how well red wine complements chicken nuggets. Spring time. That means it’s time for our annual “Vintage White Burgundy” tasting where we showcase older white Burgundies that are 10-20 + years of age. White wine does not seem to get the same attention from collectors as red. We are guilty of giving red more attention than white as ¾ of our inventory is the color red. 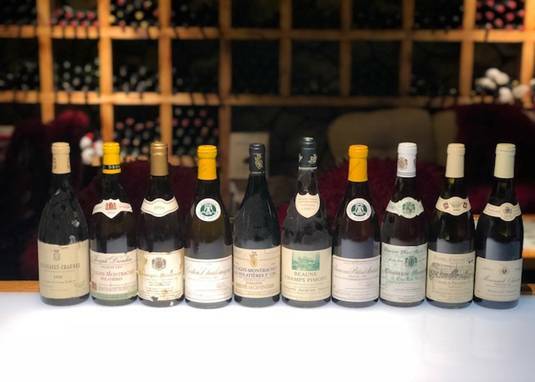 Recognition of the problem is half of the battle and we will give the great white Burgundies their due beginning tonight we will add this vintage white Burgundy tasting to our annual line-up of wine tasting events. This is all a part of the valuable scientific wine research that we are doing here at the Wine Watch, we need to know how long you can age white Burgundy for. Come and find out how these great whites are doing as every wine on the table tonight will be 10-20+ years old and everything is white! Toni Lampasone will be making a special meal to accompany the tasting wines and the fee for this event is $175 + tax, for reservations call 954-523-9463. For those of you that can’t make it I have included all the old white Burgundy that we have in the store, there are only a few bottles of each of these wines available.